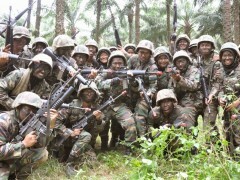 The joint unit of Reserved Officer Training Unit (ROTU) Army from University of Malaya and International Islamic University Malaysia (IIUM), in collaboration with Universiti Pendidikan Sultan Idris (UPSI) has organized Ex Leopard which has commenced from 20th January 2019 until 2nd February 2019 at 93 DPP Kem Mempaga, Bentong, Pahang. Throughout the period, cadet officers of all levels will be tested with their acquired knowledge and skills during their local trainings and applying them in the battlefield exercise. There are three battle phase which are carried out by different levels – Counter Insurgencies Warfare, Conventional Warfare and Compass Marching. Assoc .Prof .Dr. Zulkifli Hassan , Deputy Rector of Student Development and Community Engagement (SDCE) took his time to visit the training sites which are all based around Bentong, Pahang on 25th January 2019. Assoc .Prof .Dr. Zulkifli Hassan also spared his time to visit Senior cadet officers training site and granted with the chance to fire the General Purpose Machine Gun (GPMG). He had too taken part in the withdrawal phase together with Senior cadet officers later that night . The withdrawal phase is part of the Conventional Warfare, where the troops are ordered to move as far as 7KM from the sites at given time. The purpose of the phase is to avoid from being defeated by the enemies and also to reorganize the strategies and the troops. Later next day he managed to meet and greet the Junior cadet officers at Felda Mempaga 2 during their compass marching. The compass marching exercise was executed for three days where cadet officers would have to navigate with compass and local map to reach their respective checkpoints. The training site is based in Felda Mempaga 1, 2 and 3 and covered around 23 map square - which is equivalent to 23KM on actual terrain. The visit ends after he spared his time with the Intermediate cadet officers during their TEWT test on the 26 January .